Tires are an important part of everyday driving as they affect steering, braking, stability, and handling. Tire plays a huge role in keeping you and your family safe on the road. Using the right tire will improve traction, performance, and better gas mileage so you will want to be sure you get the best performing tires at an affordable price! There are several manufacturers of tire out there each promising optimum solution and performance for your vehicle, but how do you choose the right one? Here at xlraceparts, we review one of the best product in the market putting in some vital consideration like quality, performance, customer ratings, the manufacturer’s history and other factors that affect usage and performance. Hankook is a Korean company founded in about 1941. Initially named Chosun Tire Company, the tire company was later renamed to Hankook in 1968. Hankook provides original equipment for several foreign and domestic automobile companies like Toyota, Hyundai, Ford and General Motors worldwide. It also offers a complete line of replacement tires for light and heavy cars. The tire company is now the fifth largest tire company in the world with a wide range of product line tires for cars, SUVs, commercial vehicles, light trucks, trailers, buses, and motorsports. 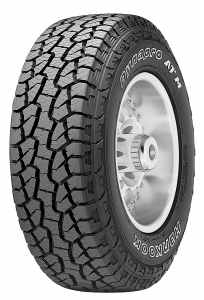 The DynaPro ATM is a premium off-road tire designed for light trucks, sport utility vehicles, SUVs, pickups, and van. The tire offers the best grip and acceleration both on good and bad road. The wraparound tread gives the tire a rugged look and increases puncture resistance. The Hankook DynaPro ATM was designed with off-road drivers in mind. That is to say, the DynaPro ATM was explicitly built for SUVs, light trucks, pickups to handle a wide array of road challenges. The steeply angled tread pattern helps to evacuate stones and debris from underneath the tire, allowing for stability on the rough or wet road. Not only does the Hankook tire perform well during good and bad weather, but its high silica rubber and orange oil-infused compound also make it durable and environmentally responsible. The tire pattern between the blocks helps to grip the snow, maintain its rigidity and channel water out during the rainy period. The Hankook DynaPro ATM is your off-road survivability tire. The tire is flexible, offers excellent traction and is built to stay in one piece when hitting rocks. The DynaPro can roll down the rough road reasonably smoothly and smartly. It mild tread pattern works well on sand without digging it. The Hankook offers a quiet, smooth ride both on the street and on the highway. The tiny spies are designed to block ice, snow, pavement and some rocky terrain from causing damage to the tire. The tread and sidewall flex envelope obstacles and resist tearing to a reasonable degree. The tire performs well on terrains and can climb rocks and granite since it’s designed for the purpose. The tire is one of the best off-road tires on the market at an affordable price. If you are one of the drivers that go off road often, then you will need special tires suitable for your exploits. The Hankook DynaPro ATM is specially designed for your SUVs, CUVs, light trucks, pickups to withstand the rigors of off-road terrains. The tire features a 5-rib design that makes it perfect for both on and off road territories. The material used makes it perfect for handling when driving your car. The tire has wet traction making it perfect to use in wet weather. The Hankook tire stands out among other tires.